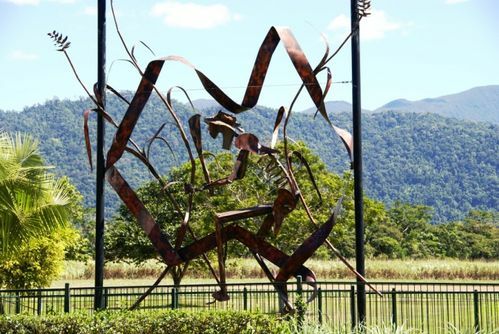 A sculpture commemorates the canecutters of the Mossman district. The first sugar cane was grown in southern Queensland in 1862 and gradually the industry spread northwards. Sugar cane has been grown in fertile pockets of the tropical north coast of Queensland since the 1870`s. Between 1863 and 1904, 60,000 South Sea islanders, known as Kanakas, were forcibly brought to Queensland to work on the sugar plantations and, until legislation was passed in 1904 banning their further employment, they formed the bulk of the workforce. Their loss caused a significant labour shortage and Japanese and also Indian workers were later employed until, after World War One, many Italian migrants arrived. In the early days cane was harvested by hand and moved by horse-drawn wagons to the tramways, which were established at the same time as the construction of the Mossman Sugar Mill in 1897. The development of harvesting equipment revolutionised the industry and today all the cane is cut and processed mechanically. Today the whole coastal region from south of Port Douglas to the turnoff to the Daintree Ferry is a major cane-growing area.